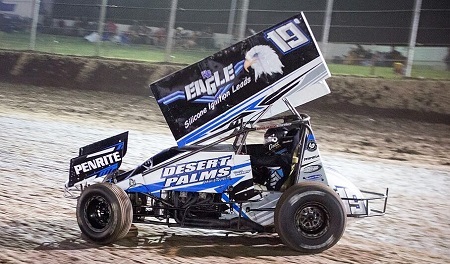 For the second season in a row Mitchell Motorsport and Driver Danny Reidy have recorded a top 5 result in the overall Ultimate Sprintcar Championship Queensland (USC QLD) after an eight-placed finish in the Grand Final last Saturday night at Toowoomba. Despite missing a round earlier in the season the fact that your worst round is dropped worked in their favour as once the points were recalculated the Eagle Silicone Ignition Leads / Penrite supported team ended the year in fifth place overall. A tough field of 27 cars turned up for the final round of the USC QLD and going into the final round Danny sat in 6th position on corrected points therefore he needed a strong finish to move into the coveted top five Championship standings. Once again, the weather played a crucial role in this race meeting with a lightning fast racing surface the result with several drivers lapping the track in the 10 second bracket. Danny's time of 11 seconds neat would usually see you on the top of the time sheets and at the front of your first heat, however Danny would start in fourth and that would be his finishing position. Danny's second heat saw a P3 starting position and in a good drive he greeted the chequered flag in third, giving Danny a straight up start in position 15 in the 30 lap A Main. With the track condition it was always going to be difficult to go forward, but Danny drove a smart tactical race to ultimately finish a very creditable eighth position and therefore elevating the team into a fantastic fifth position in the USC QUEENSLAND Series standings. "The level of competition in the USC Queensland Championship should not be underestimated. This Championship is super competitive and to finish in the top five is a tremendous result for our team. At the moment no final decision has been made on our plans for next season. These plans will be announced in the near future after we take a well-earned break" added Team Owner Peter Mitchell.